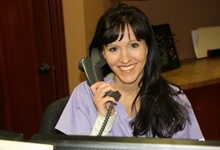 There is no need to refer you to a specialist for most procedures as we offer them here. 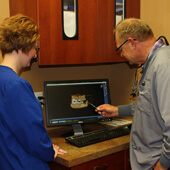 We’ve been performing oral surgeries, fitting people with braces and placing all phases of implants in-house for years. We place and restore dental implants. A dental implant is used to replace a missing tooth or multiple teeth instead of a partial or denture. Using our 3D panoramic x-ray technology we get the most accurate picture of exactly what shape the implant needs to be. We also offer mini implants which can help to secure a loose denture. Dental crowns are used for a variety of reasons: to prevent a tooth from breaking, to repair a broken tooth, for teeth with large fillings, for cosmetic reasons or for dental bridges and implants. We use CEREC technology for most of our crowns, which means you leave with the right fit and the right color in one appointment. We also guarantee our crowns with a 5 year warranty. For teeth that are severely damaged or infected, a root canal may be an option to prevent the tooth from being extracted. Most root canals can be completed in our office with one appointment. For patients who have suffered from the loss of some or all of their teeth, we offer a variety of options based on what best fits your needs. Our goal is to provide dentures or partials that look natural and offer a comfortable, secure fit. We also offer mini dental implants in which a denture snaps onto the implants for the most secure fit. For some patients wisdom teeth need to be removed because they become infected or don’t come in straight and can crowd or damage the teeth around them. Through the use of our panoramic x-ray technology we can monitor the presence and condition of your wisdom teeth to determine if they should be removed. Patients with periodontal disease experience bleeding, bad breath or sore, swollen gums. The disease is caused from bacteria growing in pockets, the gap between your gum and teeth. It’s a very serious disease that can result in tooth loss. While surgical options are available ,we’ve seen incredible results with our soft-tissue laser treatments. Both Dr. Sanders and Dr. Kaiser are affiliate staff members at Avera St. Luke’s in Aberdeen, SD. Call us to become a new patient. We welcome all ages.